A small front yard or landscape with Kentucky Bluegrass lawn. Aggregate driveway and landscaping rocks. 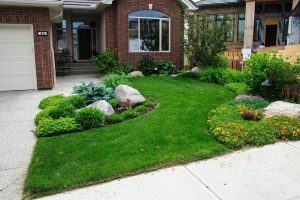 - Curb Design Inc.
A small front yard or landscape with Kentucky Bluegrass lawn. Aggregate driveway and landscaping rocks.